A Ghostly Undertaking was a delightful paranormal mystery that kept me guessing. Okay, so I'm not a super sleuth in the mystery genre, but still, I think I suspected everyone in this book at one time or another. It was fun figuring out "who done it". Set in the peaceful small town of Sleepy Hollow, Kentucky and filled with memorable and quirky characters we follow Emma Lee as she works in the family-owned funeral home and stumbles through a murder investigation. After a bump on the head, Emma Lee figures out that she can see the recently deceased. Her grandma looks like the prime suspect when her archenemy Ruthie is killed and Ruthie's ghost claims it was murder during her funeral. Emma Lee decides to help Ruthie find her murderer, and to try to keep her grandma out of jail, all while trying to seem as normal as possible when she is anything but. 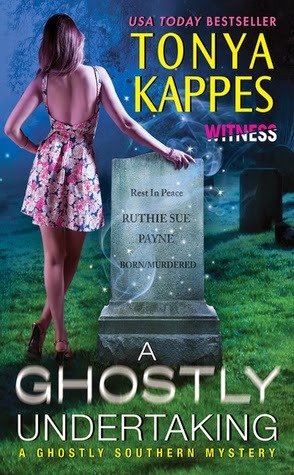 I really enjoyed all of the characters, and the ghost, Ruthie, was one of my favorites. She was funny and colorful. The author did a fantastic job of bringing all of the characters to life for me. Being from a small town myself (and across the river from Kentucky), I'd say the author hit dead on with the small town dynamics. All of the drama and busy-body neighbors were a lot of fun to watch unfold. We also get a little bit of a love interest in the sheriff, Jack Henry Ross, who is also trying to figure out who killed poor Ruthie. Overall, I really enjoyed A Ghostly Undertaking and I'm really looking forward to reading the next installment in this series, hopefully the next ghost that Emma Lee encounters will be just as fun to read about as Ruthie, and with a name like Chicken Teater it looks as if he will be. If you're looking for a fun, cozy mystery, with a touch of the paranormal I'm sure you'll enjoy this one.